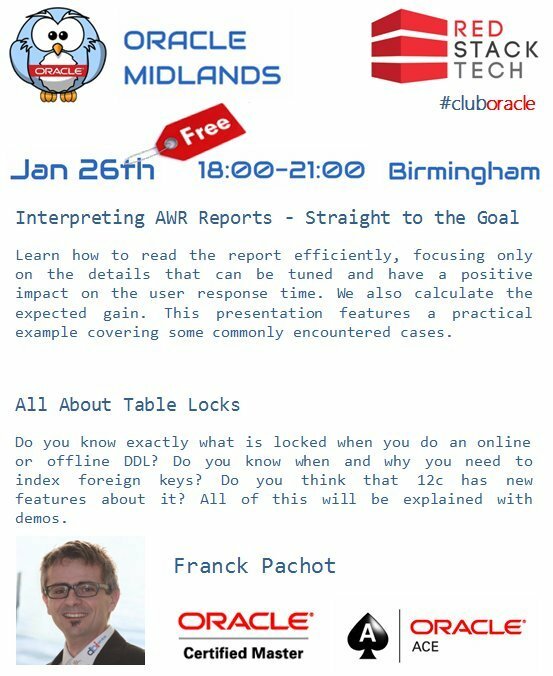 Last night was the Oracle Midlands Event #6 with Bjoern Rost. Let’s start with the important stuff! 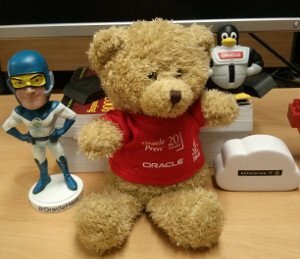 I am now the proud owner of an Oracle Press bear! I didn’t technically win it, but one of the people who did donated it to me. This was the right thing to do for two reasons. (1) I wanted it more than him and (2) it is his fault I am in my current job, rather than living the good life. Thanks Dave! After some food, Bjoern was back with 12c New Features for DBAs and Developers. This was a quick tour through some of the cool bits of 12c. I like the way Bjoern presents. He’s very honest about features he’s not used much yet, which makes a change from people acting like they know everything, only to crumble under questioning. It also makes the talks very amusing, as well as being informative. Having spent so long with him on the APAC Tour, it was surprising that I hadn’t seen him present either of these talks before. After the event a few of us ventured over to the German market, which was actually closed by the time we got there. 🙂 Instead, we went into a local pub and discussed life, the universe and everything until far too late. Thanks to RedGate for sponsoring the event, allowing it remain free. Thanks to Mike Dirden for organising the event. Thanks to Bjoern Rost for coming to entertain us and to the Oracle ACE Program for getting him across to us. Thanks to Oracle Press for my bear. Thanks also to the attendees, without whom this would not happen. Please keep spreading the word. What a cracking Oracle Midlands event! The evening started with a session on “Designing Efficient SQL” by Jonathan Lewis. The first few slides prompted this tweet. When someone asks me a question about SQL tuning my heart sinks. It’s part of my job and I can do it, but I find it really hard to communicate what I’m doing. Jonathan’s explanation during this session was probably the best one I’ve ever heard. Rather than trying to explain a million and one optimizer features, it’s very much focussed on a “What are you actually trying to achieve?” approach. It should be mandatory viewing for all Oracle folks. After the break, where I stuffed myself with samosas, it was on to the lightning talks (10 mins each). How to rename a 500gb schema in 10 minutes – Richard Harrison, EON : Why can’t we have a rename user/schema command? Richard showed a quick way to use transportable tablespaces to rename a schema. Neat! Installing RAC: Things to sort out with your systems and network admins – Patrick Hurley, Scale Abilities : Patrick is a cool guy and he upped his cool rating further by brandishing a light sabre as a pointer during his talk! His session was a list of gotchas he’s encountered while installing RAC. Some of them I’ve encountered myself. Some not. Good stuff. Mike McKay-Dirden recently wrote to me asking if I would speak at a new event he’s trying to establish called Oracle Midlands. You can read his thoughts about it on the about page. It’s similar to the types of things the Pythian guys do with the local meetups. The first event is on January 7th in Birmingham, with myself and Pete Finnigan speaking. It’s a free event, which is being sponsored by those kind people at Red Gate Software.